As results are entered into the competition, the ladder will automatically update to reflect the changes. 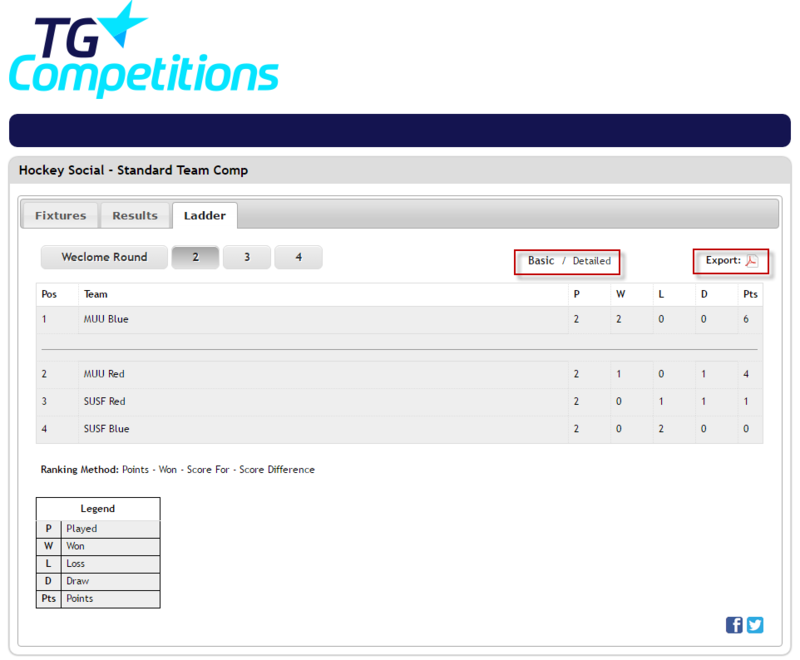 This will automatically add points to teams based upon the sport's scoring settings and realign the ladder accordingly. Teams can view this ladder on the Sports portal and have the ability to print this off as required. 2. Select the relevant competition from the listing. This will display the fixtures for the competition. 3. Go to the LADDER tab. 4. Select BASIC above the ladder.
. Click EXPORT PDF to download a PDF of the ladder and print from your computer. 5. Click EXPORT PDF to download a PDF of the ladder and print from your computer. To be able to download and print the competition ladder you need to have Adobe Reader installed on your computer. This can be downloaded for free from their website.